One of the best tools to investigate backlink information is Majestic SEO. These are links within your site and help with the navigation around your site. This will lead to a better user experience, and this will be noticed by Google and can help with your rankings in the search engines. It’s good practice to display links via your menus, sidebars, text links, footer, etc, to make navigation around your site easy. Besides keeping visitors happy, you must also keep the search engines happy. A common way to do this is to provide a sitemap, which tells the search engines of all the pages on your site, making it super easy for them to find, and hopefully index, all the pages on your site. Backlinks are when other pages on the internet point to your website. If you have a lot of relevant sites with high authority pointing towards your site, Google notices this and this can have a positive effect on your site’s rankings, as it can be deemed that your site is more important and trustworthy. Here you can analyse the link profile of your site. Lots of links from relevant authoritative sites is good, especially if the number is growing. Lots of links from low quality of spammy sites is not so good. If you have this problem, they can be hard to get rid of, but try contacting the webmaster and ask for the links to be removed. The free plan limits the number of searches you can do per day, so use sparingly. 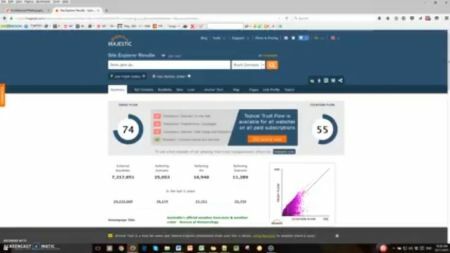 You can analyse the backlink profile of your own website, plus that of your competition, and see if this is an area whereby you can do some work to start to rank better in the search engines. Backlinking is a powerful strategy but can take time and effort. The sooner you start, the sooner you will see results, so get started today.